Rated at 270A these 6phase units offer greater idle performance with a higher efficiency than our standard Motorcraft 3phase units. 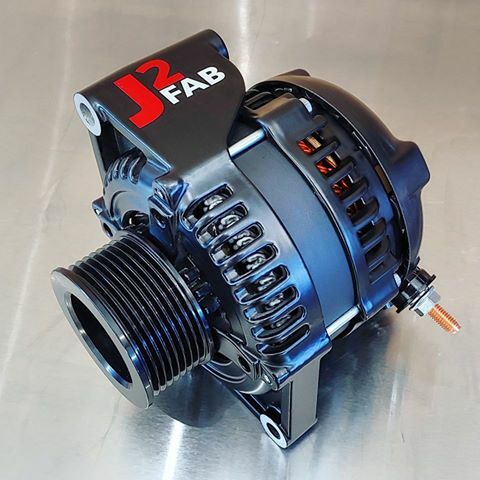 The J2Fab 6 phase hairpin alternator is our premium offering. Rated at 270A these 6phase units offer greater idle performance with a higher efficiency than our standard Motorcraft 3phase units. 100% new components and direct bolt in case. Custom rotor/stator to decrease air gap to improve idle output. Balanced rotor and 0 run-out slip rings to improve unit life and eliminate battery light flicker. NTN premium and NSK USA bearings. This unit features an OEM diameter pulley. This pulley is suitable for stock and 2lb lowers. If you have a larger pulley or spin in excess of 7200rpm please contact us for pulley sizing. 270A J2Fab units require cable upgrade.